The squadrons of New Hampshire Wing, Civil Air Patrol are seeking mentors interested in youth development to donate their time and expertise to our cadet program as a part of the all-volunteer United States Air Force Auxiliary. Our cadet program officers manage the highly structured, nationally mandated training and leadership curriculum at each of our local squadrons. 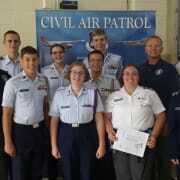 Cadet program officers serve as mentors, program managers and adult leaders. While no military experience is required to assist in the management of the cadet program, in some areas (ie. uniform wear, cadet drill & ceremonies) it is helpful. A sincere interest in mentoring young people in areas of leadership, aerospace, physical fitness and character development. Previous military leadership experience is helpful, but not required.